Penny candy was once a favorite treat among school children. 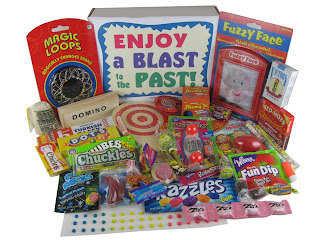 The candy's bright packages, low price, huge selection, and wide availability made it something that every child could afford and look forward to. To add to the appeal, many candies offered prizes to children who carefully saved up the candy packages and mailed them in. The first penny candy in America was the Tootsie Roll, which was introduced in the late 1800s. Many candy makers quickly followed suit with the industrial revolution making mass production easier and a drop in the price of sugar making candy cheaper. Before long, hundreds of penny candies were available in stores nationwide. After decades of great popularity, penny candy saw a rapid decline in the mid-1900s. The decline was due impart to inflation and a changing market. Many penny candies even fell out of production during this period. While once available for purchase at every street corner market and candy shop, today penny candy is generally sold only in bulk at big-box stores or by the pound at specialty stores. The term "penny candy" used to refer to the price of the candy. Today "penny candy" is applied to any individually wrapped candy that has been in production for at least 50 years or is sold by the pound. Root Beer Barrels, Mary Jane, Bit-O-Honey, candy corn, chocolate bars, and suckers are a few of the more popular penny candy pieces that have lasted the test of time. Some new penny candies have also joined the market including fireballs, exotic flavored jelly beans, and Pop Rocks. Old school penny candy has been making a come back in recent years. Adults now crave the candy that they once bought and loved as children. To meet this growing demand, many candy makers have begun searching for old recipes and clues to bring discontinued candies back to life. Thanks to this effort some old candies are available and enjoyed again (mostly at specialty stores). Even though old candies are returning, the price isn't. A piece of penny candy now ranges in price from 5 to 99 cents. Old school penny candy has also become a popular gift. Adults enjoy the walk down memory lane while children can share in a little part of history. Specialty candy stores offer a variety of gift baskets brimming with penny candy. Some of these gift baskets feature candy from a specific decade or brand. No matter which gift basket is chosen, it promises the recipient a tasty treat.